How much does it cost to travel to the United Arab Emirates? How much money will you need in the United Arab Emirates? AED1,008 ($274) is the average daily price for traveling in the United Arab Emirates. The average price of food for one day is AED150 ($41). The average price of a hotel for a couple is AED989 ($269). Additional pricing is in the table below. These average travel prices have been collected from other travelers to help you plan your own travel budget. How expensive is the United Arab Emirates? How much money do I need for the United Arab Emirates? The United Arab Emirates (UAE) is a federation made up of seven emirates on the Arabian peninsula. The seven emirates include Abu Dhabi, Dubai, Sharjah, Ajman, Umm al Quwain, Ra's al Khaymah, and Fujairah. Abu Dhabi is the largest, but Dubai is the most well known and frequently visited. 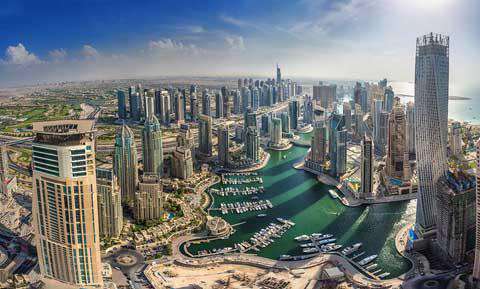 The United Arab Emirates is a very modern country immersed in culture and history. The infrastructure in the country if very good, but perhaps a little overcrowded. Imports from the west are readily available in shops. It's a very clean and modern country to visit, and many people enjoy seeing this pristine side of the Middle East, while others see it as little more than a "Disney World" style experience. Part of the appeal in visiting the UAE is to see the extreme and impressive luxury resorts that are popping up in areas like Dubai and Abu Dhabi. To simply visit these resorts is a very unique experience. The two most famous resorts are the sail shaped Burj al-Arab in Dubai, and the Emirates Palace in Abu Dhabi. Both Abu Dhabi and Dubai have large expat communities, so you will find many different European and Indian restaurants and brands for sale. There are many large shopping malls and supermarkets where you can find anything you might be looking for. There are also many western chains around including KFC, McDonalds and even Ikea. English is widely spoken, particularly in the tourism industry, so you should have very little trouble communicating. Alcohol is available in most hotels, bars, and restaurants. There is a law that requires a license to purchase alcohol, but this law is often overlooked. The license is a statement that the individual is a non-Muslim. A trip to the UAE really offers a glimpse into a world where cultures are colliding. Conservatism meets modernism and technology is integrated with traditional values. It's a fascinating place to visit, particularly if you can take the time to get outside of the major cities and see what else the country has to offer. The weekend here is on Friday and Saturday. Many businessmen work a half day on Thursdays, but they do often work the entire day on Saturday. Businesses are closed on Friday mornings, but many open in the afternoon after services and by the evening you will find many people out and about socializing. During Ramadan the schedule changes dramatically. Restaurants are closed during daylight hours and most offices and shops close down in the afternoon. The fast is broken after the sunset during a meal that is referred to as iftar. Some businesses open back up between the hours of 8:00PM and midnight. Dubai has a major international airport and many connecting flights to Africa or Asia have a layover in this city. A great way to conveniently explore the city is to extend your layover to several days. This allows you time to see what you want to see, but you don't have to buy an additional plane ticket to reach the area. Public transportation is challenging in both Dubai and Abu Dhabi. The systems are not well established and you will likely end up taking taxis to most places. Prices are cheap however. You can expect to pay about US$2.00 to most places within the city. An additional US$3 may be added to the total during evening hours after 10:00 PM. If you plan to travel between cities, renting a car is a popular option. Rental cars cost slightly less than you would expect to pay in the United States. The beaches in the area are quite impressive and worth a visit. The water is strikingly blue and very clean. Recent construction has made the water somewhat more cloudy, but it is still a very beautiful place to visit and not to be missed while you're in the area. There is also some excellent snorkeling and diving in the Indian Ocean. The water is very warm and clear. The beaches can range from very touristy to almost isolated, even near Dubai. Wearing a bathing suit in public is not recommended so your best option if you plan to swim or sunbath is to pay for access to a private beach near a hotel. Fujairah: This city is located about two hours by car from Dubai. It's a midsized town that is surrounded by beautiful countryside. There's a fort overlooking the town that is 300 years old. If you make the trip to the area, make sure you take time to explore the surrounding hills. Liwa Oasis: This area offers some of the largest sand dunes in the world. It's located to the south of Abu Dhabi and there are several small villages that are clustered together in the area. Hatta: Stop off at the Hatta Pools, where you can see deep canyons that have been carved out by rushing floodwater. Swimming in a bathing suit in public is not advised. Instead, consider buying a one day pass to a hotel where you can swim in privacy. In cities like Dubai, and to a lesser extent, Abu Dhabi, you can find restaurants that serve any number of western cuisines. The large expat community throughout the country means that the cuisine takes on a multicultural flare. Rice is a common stable. It is often well seasoned and served with a meat such as lamb on top. Most of the high end restaurants are found in hotels, but if you eat elsewhere you will find that most food options are quite affordable. Al Harees: This is a popular dish that is made with whipped wheat and meat. It is usually prepared for special occasions such as Ramadan or during weddings. Al Majboos: This is a delicious and filling dish that is made with meat and rice. The meat is prepared with a range of spices and vegetables. It is then served, layered with rice and saffron. Al Madrooba: This is a traditional Middle Eastern dish made from salt-cured fish. This fish is cleaned and prepared with a light flower. It is then served with ghee on top.